The Age of Antibiotics may prove to be our downfall as more and more microbes find a way around the compounds we use to treat bacterial infections. A potential antibiotic is no more tested, synthesized, clinically tested and approved than a bacterial strain finds a way to circumvent its action and shares this solution with other bacteria. While physicians are becoming more concerned about the lack of new antibiotics in their arsenals to treat patients with methicillin-resistant Stapholococcus aureus (MRSA) or other multidrug-resistant (MDR) bacteria, researchers are exploring alternative means to fight MDR microbes that can devastate human health. In Maryn McKenna’s book Superbug, Dr. Robert Daum advocated producing a vaccine against MRSA to prevent infection rather than lose the antibiotic battle during treatment (see the Nature News article on the same subject). Some scientists are rethinking bacteriophages and their use. A team of researchers at North Carolina State University discovered another option: A small molecule that attenuates the antibiotic resistance in Klebsiella pneumonia. This bacterium made news headlines when the New Delhi metallo-β-lactamase-(NDM-1) producing strain of Klebsiella pneumonia was identified first in India and then in other hospitals around the world. Unlike MRSA, which is a Gram+ bacteria, K. pneumonia is a Gram– bacterium with fewer antibiotic options when humans are infected. Therefore, managing infection in people with NDM-1 K. pneumonia and other MDR bacterial strains becomes difficult. However, if a second compound were used in conjunction with an antibiotic that made the latter more effective, the utility of that antibiotic would increase. For example, achieving the minimum inhibitory concentration (MIC) to treat a MDR bacterial strain can result in toxic side effects as well as a long course of treatment. An adjuvant that makes an antibiotic more effective at lower concentrations can minimize side effects and better clear the bacterial infection. Worthington and colleagues previously found a compound called 2-aminoimidazole (2-AI) that was able to decrease the MIC of some antibiotics against MDR A. baumannii (MDRAB) and MRSA. While 2-AI had little effect on NDM-1-producing strain of K. pneumonia, 50 other compounds that are derivatives of 2-AI were screened for suppression of resistance to β-lactam antibiotics imipenem and meropenem. Six compounds based on the structure in Figure 1 were chosen for further analysis. The R groups included chains of three to six carbons, a benzene ring and four carbons in a forked structure (t-butyl). The most effective suppressor of resistance to imipenem and meropenem had a straight chain of five carbons with four- and six-carbon chains having a modest suppression. The greatest effect reduced the MIC of imipenem and meropenem 16-fold against the NDM-1-producing strain of K. pneumonia compared to antibiotic treatment alone. The concentration of the 2-AI compounds had little microbial effect by themselves, and increasing the concentration by 1.33X and 1.66X increased the suppression of NDM-1-producing strain of K. pneumonia imipenem resistance to the point where the MIC was below the threshold for antibiotic susceptibility. Further testing demonstrated that the five-carbon-chain 2-AI compound called 3d worked synergistically with imipenem to kill the NDM-1-producing strain of K. pneumonia. To see if a more effective adjuvant compound could be synthesized, the scientists kept the five-carbon-chain moiety and added groups to position 5 on the five-carbon imidazole ring (Figure 2). Their earlier research with MRSA showed suppression with this substitution so they decided to test this with the 2-AI compound that suppressed antibiotic resistance in the NDM-1-producing strain of K. pneumonia. The R groups were similar to the ones added onto the first compound. Unfortunately, the substitutions at this position did not produce a more suppressive agent. The most effective compounds in this synthesis were only half as effective as the original and had small carbon groups substituted (i.e., methyl or propyl). 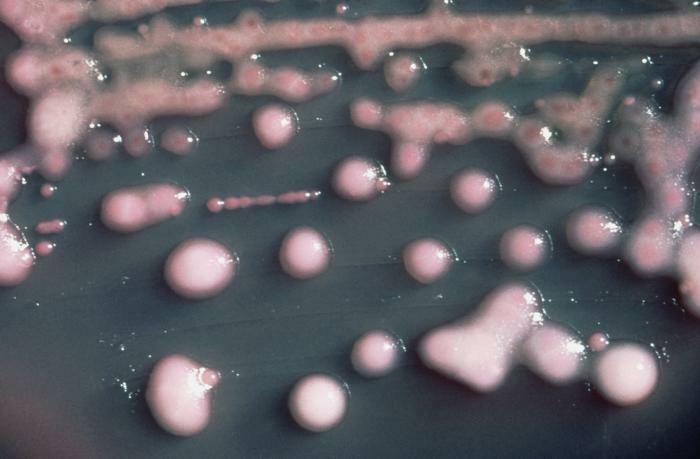 Both MRSA and NDM-1-producing strain of K. pneumonia are multidrug resistant, but they are two different classes of bacteria. Therefore, it is not surprising an adjuvant compound in one would not show the same effect in the other. The authors also tested how well compound 3d worked against other β-lactam-antibiotic-resistant strains of K. pneumoniae. For a carbapenem-hydrolysing β-lactamase KPC-2-producing strain, compound 3d suppressed imipenem MIC 16-fold while an extended-spectrum β-lactamase ESBL-producing strain reduced the cefotaxime MIC eightfold. Therefore, this antibiotic adjuvant demonstrates suppressive activity in other K. pneumoniae strains. The next question Worthington et al. wanted to answer was how does compound 3d work? Due to compound 3d’s amphiphilic (both hydrophilic and hydrophobic) properties, it could affect the bacterial membrane. In fact, experiments revealed exposure to compound 3d caused the membrane to become permeable. While this characteristic is interesting, the same test with less active compounds also demonstrated membrane permeability, leading the authors to hypothesize that the effectiveness of compound 3d does not rely solely on membrane disruption. If compound 3d could truly be used as an adjuvant for antibiotic treatment in humans, it must disrupt or destroy bacterial cells while leaving eukaryotic cells intact. When the authors examined the lysis activity for sheep blood cells versus bacterial cells, the level of compound 3d used to suppress antibiotic resistance resulted in only 2.5% of blood cells rupturing. Despite all of the antibiotics that have been developed, the brick wall of multidrug-resistant bacteria seems to render all efforts to manage infections difficult and even ineffective. In this article, the authors synthesized a compound that reduced imipenem resistance to the point where the NDM-1-producing strain of K. pneumoniae was vulnerable to the antibiotic. With the reality of few new antibiotics coming into use, new strategies to use what antibiotics are available may mean adjuvants like compound 3d are a viable method to improve human health.